So, um, hi…I’m Matt and I’m going to be guest blogging some of the Friday running columns for Mollie. 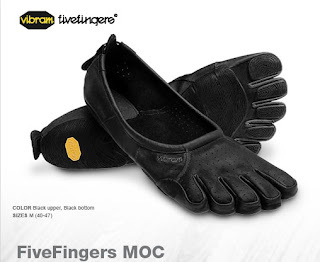 Through a co-worker, Mollie learned that I was likewise inspired by Born to Run, and decided to act on said inspiration and buy a pair of the Vibram Five Fingers (from now on: VFF - I’ve been in DC too long, so everything gets an acronym) to give them a shot. I’m slowly working them into my running routine and will be writing about my experiences. For those who haven’t read the book and/or don’t know the shoes, it’s basically an aqua slipper with a little hard rubber padding on the sole. It’s designed to simulate being barefoot and they mold pretty tight to your foot. 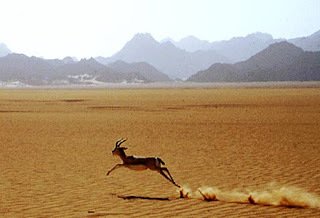 One of the premises of Born to Run is that humans are physically designed for long distance running (thank you evolution!). Via our recent dependence on the running shoe industry, we’ve lost our natural running form and are thus subject ourselves to avoidable injuries. This could all be remedied by reverting to our natural (shoeless) running state. Several different folks in the book talk about the merits of barefoot running, including track coaches who put their teams through regular barefoot workouts. Unfortunately, my concrete/asphalt existence in DC doesn’t lend itself to full-fledged barefoot running. I figured the VFFs were about as safely as I could replicate the barefoot running experience without destroying the soles of my feet. In my running life I’ve been pretty fortunate about avoiding injuries. I’ve had bursitis in my hip, and tendinitis which comes back every so often in my right knee. I can usually work through injuries quickly - so they haven’t really kept me from running. So I'm not into the VFF for injury-prevention purposes. What interests me about the VFF is that they might help me to develop better running technique…which hopefully will lead to improvements in my times. I’ve seen so many runners pass me at races who look so light on their feet, bouncing along like deer. I’m more of a plodder. Anyway, I ran out to City Sports and picked up a pair of VFFs and here we are. So a bit about myself (before I delve into my first run with the VFF). I’m currently training for the New York City Marathon in a few weeks. I usually focus more on triathlons, so this will be the first straight marathon I’ve done in years. I ran the 26.2 miles of Ironman France in June in about 4:30, so I’m hoping to do this race in about 3:30 (since I won’t have done a swim and bike pre-marathon). However, since that race I’ve been spending some quality time with my couch and the wonderfulness known as Marvelous Market Chocolate Chip Cookie…so I’m not exactly in peak race-shape. My long run on Sunday was just over 14 miles at race pace, but my legs felt pretty good, so I figured I was in good shape to give the VFFs a fair shot the next morning. Just getting the shoes on is a bit of a challenge. Like sliding on a glove, you have to gradually work it on your foot and make sure you get every toe in the right hole. I figured I’d get used to it, or just have Owen Meany saw it off. * Is the pinkie toe really that useful anyway? I think I’ve heard that future generations are going to be pinkie-less anyway…can I jump ahead on the evolutionary chart? Born to Run mentioned an ultra-marathoner who, in an effort to improve results, had all his toenails removed. So while I joke, I’m sure there are others who would seriously consider the pinky-removal option. One more thing about the shoes before I talk about my run. You will look silly, there’s no avoiding that. If you’re self-conscious, these aren’t the shoes for you. I’m currently running in a pair of God-awful fluorescent green Newtons, so I’m obviously not that hung up on looking silly while I run. But in the VFFs, you will definitely attract curious stares. My route was just an easy three-miler from my place in Columbia Heights through Adams Morgan and back. I was on sidewalks and streets the whole time, although when I had the chance, I ran on gravel, and some rougher surfaces just to see how the shoes felt. You can definitely feel obtrusions in the surface more than when you’re wearing a standard running shoe (hello there gravel! ), but it was never painful or enough to stop me from running. I was surprised to find that once I started running, the shoes didn’t feel as awkward as I anticipated. I fell into a pretty natural cadence and stride right away. I’ve been running in Newtons for just under a year now (for more info on Newtons – check out this site). Perhaps that experience made the switch to VFFs less of a shock, since both shoes force you to run on the balls of your feet. I failed to time myself during the run - I never pay attention to time during my recovery runs - but for blogging purposes, I will try and note time in my next entry. I think I was able to run at a faster pace than I expected. My initial VFF impressions are good. It was much easier and normal-feeling than I expected, so I’m looking forward to next week’s run. As my long runs are tapering towards the marathon, I might try and make my recovery runs longer just to see how the shoes feel over longer distances. Maybe a persistence-hunt should be the litmus test on whether these shoes are any good? Mollie and her Nat Geo cohorts need to get on this…I’ll train in these shoes for several months and this spring they can fly me to the Serengeti where I will try and run down a gazelle. It’s got to be more compelling T.V. than Ice Road Truckers. Just an idea. That’s all for now! "John ends his graduate work and is about to be drafted. Owen, however, saws John's finger off with a granite cutting saw to avoid it. John later learns from Owen's diary that this was both to save his friend and to avoid John having to go to Vietnam, since Owen sees him in the dream and he will die there."